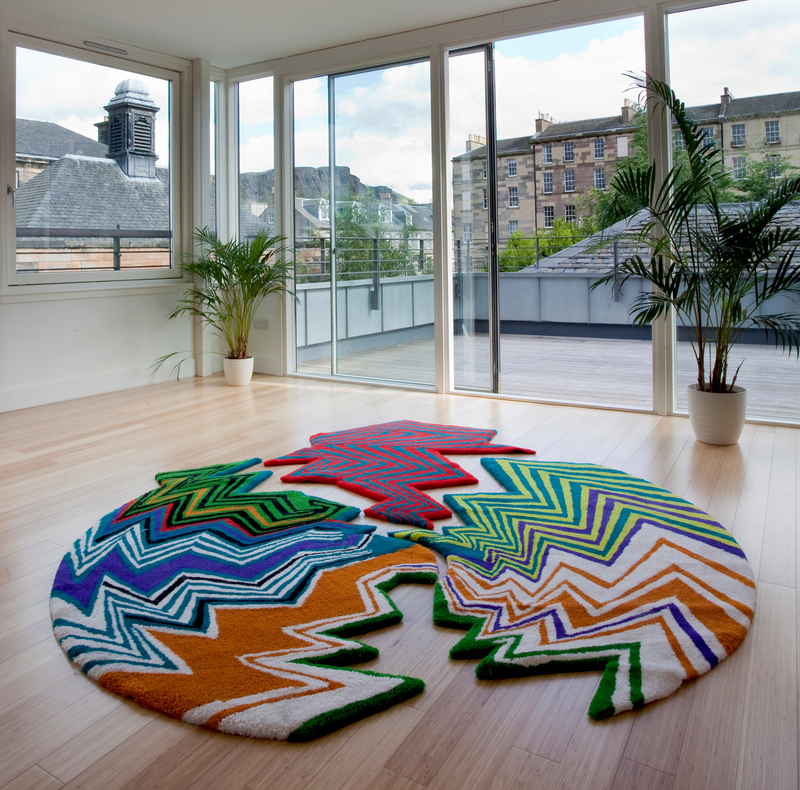 Dovecot was approached by the Glasgow School of Art fashion graduate Jamie Bruski Tetsill to produce a gun-tufted rug at the Studio in 2008. Tetsill had received funding that would allow him to take part in 100% Design Tokyo and as part of his textile design showcase he had a vision to include a rug produced in collaboration with Dovecot. Tetsill’s textural clothing designs were characterised by geometric motifs and patterns, formed by a sophisticated tufting process which Dovecot recognised could be interpreted with dramatic effect in an interior rug design. After discussion with Master Weaver Douglas Grierson and Weaver Jonathan Cleaver, Tetsill developed a design for Rug 01; a dynamic interior textile, with distinctive bolts of geometric coloured shapes spiralling out from a central point much like a Catherine Wheel. The rug’s unconventional three part composition alludes to a kinetic or explosive element and can be displayed with the sections together or apart.